When the temperature plummets, we often turn to homey, comforting classics to warm us from the inside out. If this sounds like the perfect cure to all your cold weather woes, look no further. 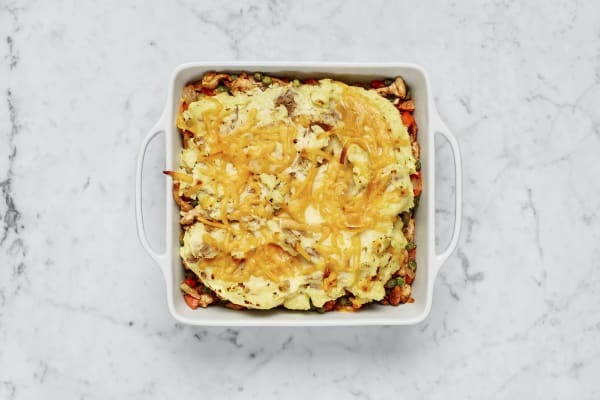 Our chefs took the best parts of chicken pot pie and shepherd’s pie and combined them to create the world’s greatest dinner mash-up. 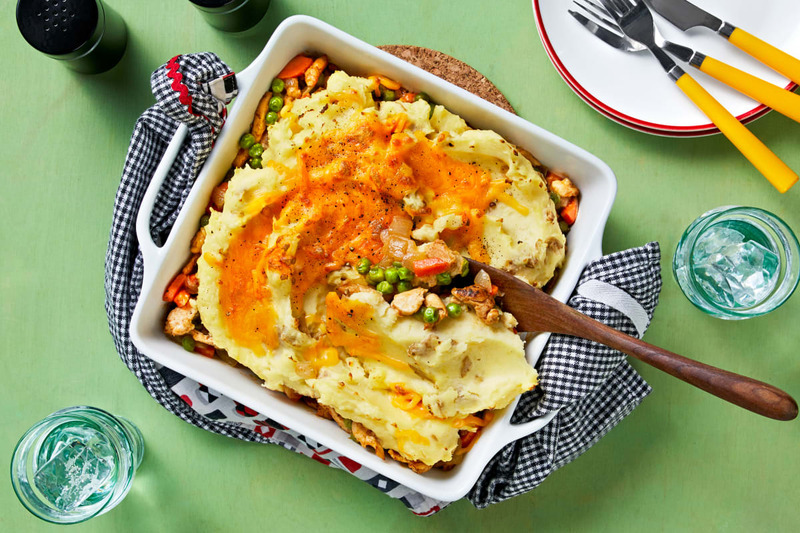 The base is a rich chicken stew with pops of fresh peas and carrots. On top, swoops of creamy mashed potatoes are sprinkled with cheddar, then broiled to create an irresistibly cheesy crust. It all bakes up in one dish, making it easy as...well, you get it! Preheat broiler to high (or oven to 500 degrees). Wash and dry all produce. Halve, peel, and dice onion. 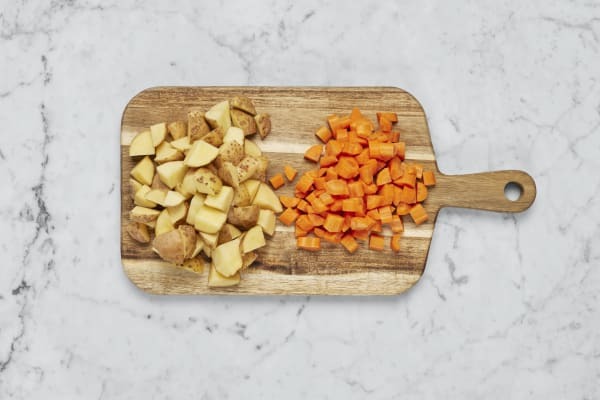 Peel carrot; quarter lengthwise, then cut crosswise into ¼-inch-thick pieces. Dice potatoes into ½-inch cubes. Pat chicken dry with paper towels; season all over with salt, pepper, and half the Fry Seasoning. Meanwhile, heat a drizzle of oil in a large pan over medium-high heat. Add chicken and cook, stirring, until browned and cooked through, 5-6 minutes. Transfer to a cutting board. If necessary, cut into bite-sized pieces. Place carrot in a medium bowl with a splash of water. Cover with plastic wrap. Microwave on high until soft, 3-4 minutes. Drain. 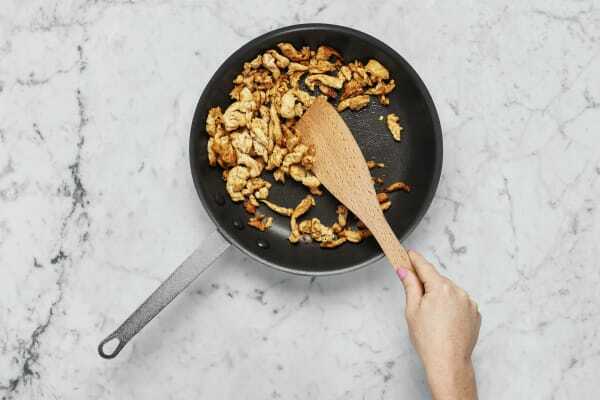 Heat a drizzle of oil in pan used for chicken over medium-high heat. Add onion and cook, stirring, until lightly browned and softened, 4-5 minutes. Stir in 1 TBSP butter until melted, then stir in flour and remaining Fry Seasoning. Cook for 1 minute. Gradually whisk in 1 cup water and stock concentrate. 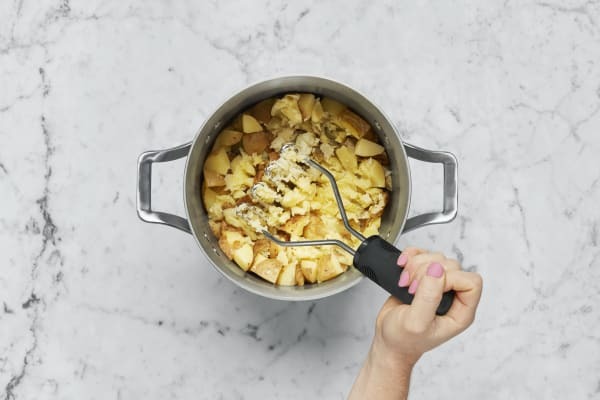 Reduce heat to medium and simmer until thickened, 2-3 minutes. 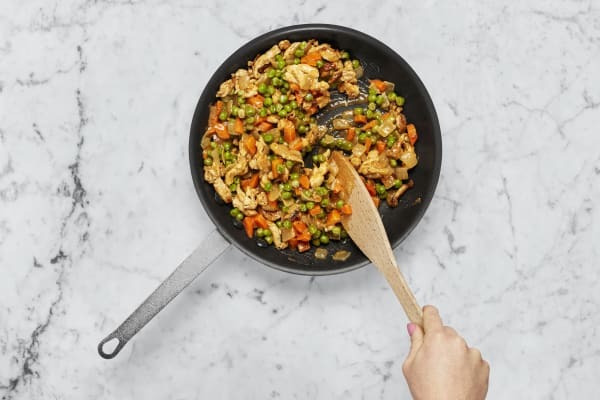 Stir in peas, chicken, and carrot. Season with salt and pepper. 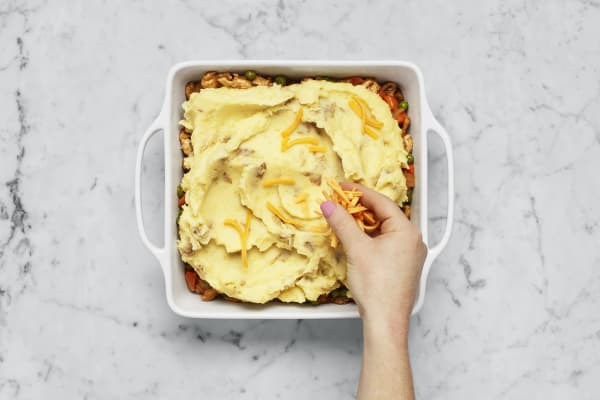 Transfer filling to an 8-by-8-inch baking dish (use a 9-by-13-inch baking dish for 4 servings). Evenly top with mashed potatoes. (TIP: It’s okay if the potatoes don’t reach the edge of the baking dish.) Evenly sprinkle with cheddar. Broil until cheese has melted, 2-3 minutes.